OK, I figure it is time to get on board for the 2nd Annual Steel Guitar Cruise, February 2, 2018. We had a BLAST on Cruise #1 last February. So plan you a 4 day vacation with us. What could be better that being with "YOUR" steel guitar familyon a beautiful CRUISE SHIP! We make music together, fellowship together, eat together, sometimes drink together and more than anything we have FUN together. An excursion will be planned for Saturday in Cozumel, so be sure and ask Jacki about this. I know that I am going this year. Call Jacki Hardy, 812-691-4369, to make your reservations. Now here is some more great picking from the 1st Annual Steel Guitar Cruise. The one and ONLY Tommy Dodd picking an old pop classic "New Kid In Town". Enjoy and please share this on your page. Who all went to the first cruise and where does it leave from? When you ask "who all went", are you meaning the players or everyone in the audience? (not sure I could answer the later). BTTT - getting close!!!! Still some cabins left. Go to www.steelguitarcruise.com to see details and booking information. DO NOT BOOK THIS CRUISE DIRECTLY WITH CARNIVAL; you MUST book with Jacki Hardy with info posted at www.steelguitarcruise.com - this is gonna be awesome,...just like last year, for sure !!!! I really enjoyed cruise #1, and I'll be back for cruise #2. 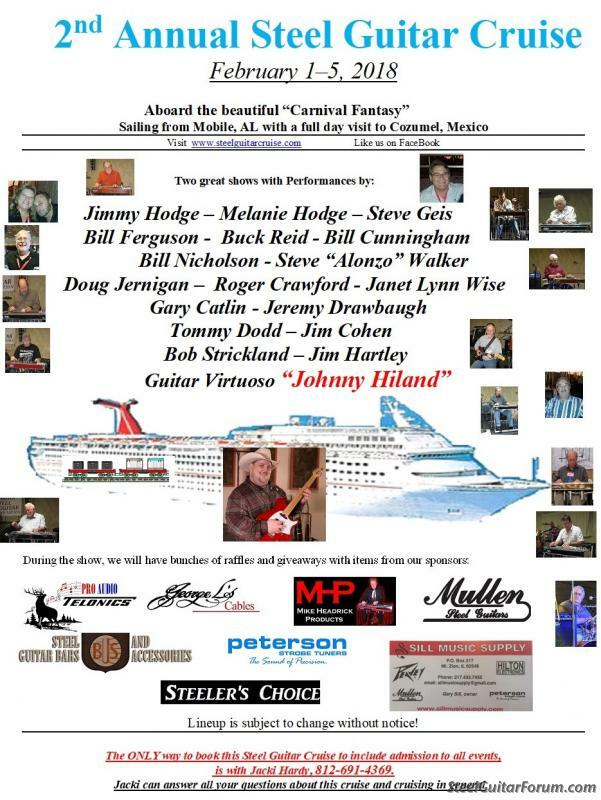 Wow, we are only about 3 months away from the 2nd Annual Steel Guitar Cruise. Our founder, Jimmy Hodge and co-producer, Steve Geis, just made a visit to Nashville to talk to some of the cruise pickers. Here is a little promo video. I'm booked and looking forward to meeting some folks. I'm still a newbie at the steel, but I know how to have a good time. WooHoo! Looking forward to it. Please send me your email address so that I can add you to my list for any updates. Here is another in a series of promo video's. Interview with my friend Buck Reid was a lot of fun. Buck is not only an amazing steel player, but he is just an awesome guy. Please don't miss this great venue on the Carnival Fantasy on Feb 1st out of Mobile Alabama!!! Hope to see you on the boat!!! I can't begin to express how much fun we had with all our steel guitar friends!! Such a special trip - and we're doing it again!!! There is still time to sign up for the Steel Guitar Cruise!!! Buck Reid, Doug Jernigan, Johnny Hiland, Jim Cohen, Tommy Dodd, Jimmy Hodge,...and the list goes on. Two days of steel guitar music and a day in Cozumel AND ALL ON A CRUISE SHIP!!!! Don't miss out; this is gonna be awesome. Prices vary depending on the type room you select. This is getting awfully close! Looking forward to another great show on a first class venue. Posted 21 Jan 2018 11:46 am Still A Few Cabins Available!!!! Hey Steve - Is there a list of steel guitar attendees available? Down to the wire, and still need to get my fake tan going! Ha! Ha! It's all in fun! Yep, one week from yesterday we will be boarding the beautiful Carnival Fantasy for a great venue for a great steel guitar show !! Can't wait! !